Builders: VT Halter Marine, Inc. 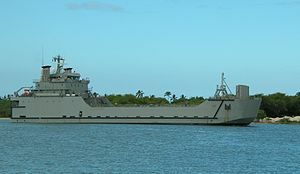 The General Frank S. Besson-class Logistics Support Vessels (LSV) are the largest powered watercraft in the United States Army, and are designed to give the Army a global strategic capability to deliver its vehicles and cargo. Named in honor of Gen. Frank S. Besson Jr., former Chief of Transportation, U.S. Army, these ships have bow and stern ramps and the ability to beach themselves, giving them the ability to discharge 900 short tons of vehicles and cargo over the shore in as little as four feet of water, or 2,000 short tons as an intra-theater line haul roll-on/roll-off cargo ship. The vessel's cargo deck is designed to handle any vehicle in the US Army inventory and can carry up to 15 M1 Abrams main battle tanks or 82 ISO standard containers. USAV General Frank S. Besson Jr (LSV-1) docked across from the USS Intrepid in Manhattan during Fleet Week 2010. LSV alongside USNS Pollux (T-AKR-290) in the port of Pusan, South Korea. Pollux is loading vehicles onto the LSV which will then transport them to shore. This page was last edited on 13 May 2018, at 20:47 (UTC).